U.S. #2862 pictures a 1929 self-portrait. 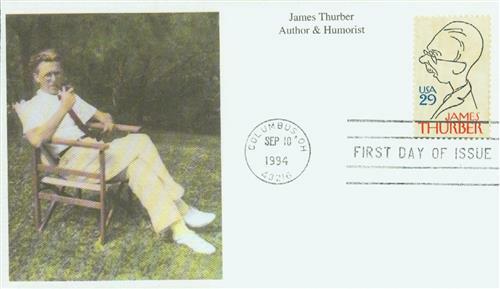 Cartoonist, author, and humorist James Grover Thurber was born on December 8, 1894, in Columbus, Ohio. When he was a child, Thurber and his brother played a game of William Tell (shooting an apple off someone’s head), during which his brother accidentally shot him in the eye. He eventually went almost blind and was unable to play sports or join in other activities. Instead, he found he had a boundless creativity and enjoyed writing. Item #4902831 – Thurber First Day Proofcard. Thurber went on to attend Ohio State University from 1913 to 1918. Never receiving his degree, he went on to work as a code clerk for the Department of State in Washington, DC, and later Paris. From 1921 to 1924, he worked as a reporter for the Columbus Evening Dispatch. In 1924 he moved to France, where he worked for the Paris edition of the Chicago Tribune before returning to New York City in 1926 to work as a reporter for the New York Evening Post. In 1927, Thurber joined the newly established magazine The New Yorker as a managing editor and staff writer with the encouragement of E.B. White. Three years later, White discovered some of Thurber’s drawings in a trash can and convinced him that they were good enough for publication. From then until the 1950s, Thurber wrote and illustrated for The New Yorker. U.S. #2862 – Thurber Silk Cachet Combination First Day Cover. 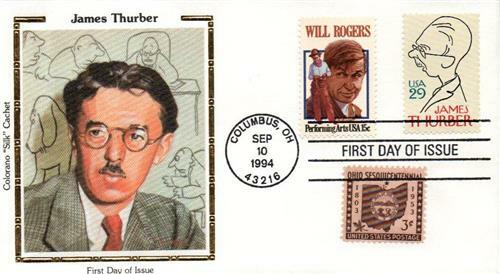 A prolific writer, Thurber published 31 books, wrote numerous short stories and essays, and even wrote a play. His writings and drawings often concerned men who were frustrated with complaining wives, disobedient children, and boring jobs. They often escaped these pressures with alcohol. Thurber’s most famous short story is titled “The Secret Life of Walter Mitty.” In this story, Mitty finds relief from his wife by daydreaming. Mitty is always the hero in his dreams, fearlessly saving the day. This story was made into movies in 1947 and 2013. 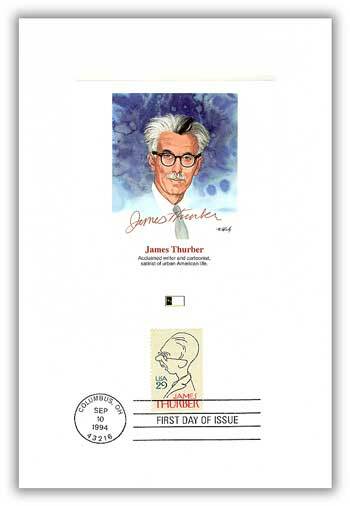 U.S. #2862 – Thurber Mystic First Day Cover. 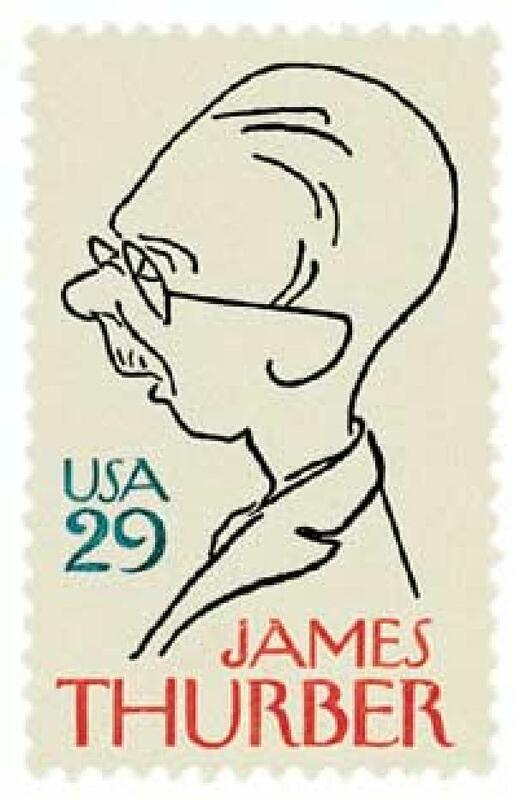 Thurber died on November 2, 1961, in New York City. Click here for more about Thurber and here to read some of his New Yorker work. 3 Responses to "This Day in History… December 8, 1894"
I wonder how many public school rubes even know who James Thurber is. Oh well.